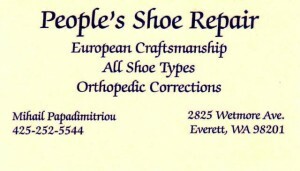 Mihail Papadimitriou continues to operate People’s Shoe Repair in Everett, Washington, which his uncle originally began in 1934. The quality of his craft and the loyalty of his customers make his story unique in Washington State. Mihail “Mike” G. Papadimitriou was born on May 22, 1930, in the village of Ampelakiotissa, north of Nafpaktos in the mountains of Central Greece. 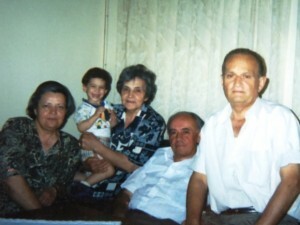 His great grandfather was a priest by the name of Dimitri and, as was common at the time, surnames of priests were preceded by “papa.” Thus the names, Papaioannou, Papageorge or Papanikolaou indicate there was a priest in the family at an earlier time. 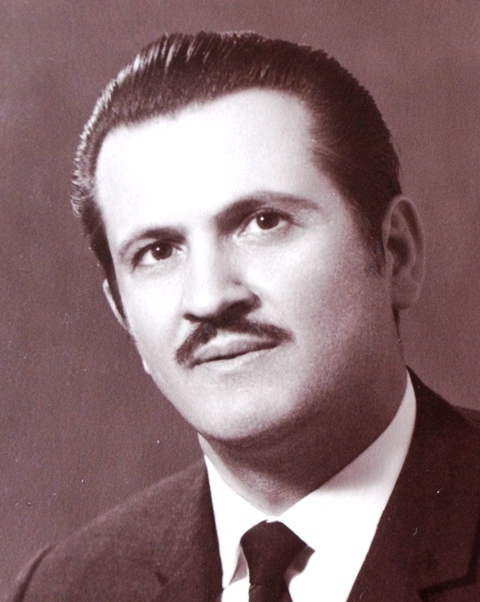 While Mihail resisted shortening his surname to Pappas, even though many Greeks shortened their surnames accordingly, he uses Mike for his first name as it is easier to pronounce than Mihail. 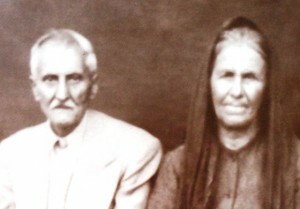 His parents, Georgos and Konstandina (nee Raikou), were from the same area of Greece. The couple had six children: Anastasios who became ill and died at a young age, Policarpos, Policarpia or “Carpoula,” Mike and younger twins, Pericles and Smaragho. 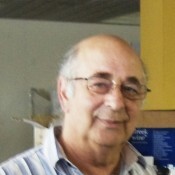 Mike still speaks regularly by phone with his siblings who live in Greece. As a child during World War II life was “not much fun.” He remembers his village being occupied by Italians who didn’t like to fight but would rather play the guitar and sing and, with no transportation back to Italy, two of the soldiers stayed for another year after the War ended. However, the villagers were treated much worse during the German occupation. Mike remembers the destruction of a small garden next to the family home during this time. At age five he attended school two blocks away from his home. He does remember one humorous event when he mischievously used a small mirror to reflect the sun onto the school building. When the source of the light was discovered, Mike had his ear pulled severely by the teachers. He attended school from age six to twelve during a time when there was a shortage of teachers. Mike’s father and Uncle Dimitri “Jim” had been in the United States as early as 1908 where they worked in the mines in Montana. Mike’s father returned to Greece in 1914 to fight in World War I. Georgos never returned to the States. Remaining in the States, Jim eventually opened a shoe store in Everett in 1934. At the age of 17 Mike’s family moved to Athens, Greece, where he remembers his father shoveling coal to heat the government buildings during the winters. Mike was able to find a position in a shoe store where he worked for a year without pay for Mr. Theodosiadis. The store had a good customer base where Mike learned the business of crafting and repairing shoes. 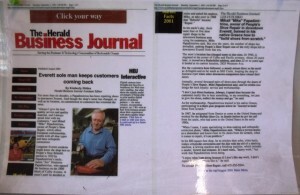 He recalls delivering shoes to the customers’ homes on Saturdays and receiving a few tips for his efforts. 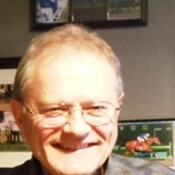 For the next 20 years he perfected his trade in Athens. However, Mike’s dream was to come to the United States. Because of immigration quotas, his name was placed on a waiting list. When, after a long wait, he went to sign his passport at the American embassy, he was told that because he could not speak English he would be sent back even if he made it to America. 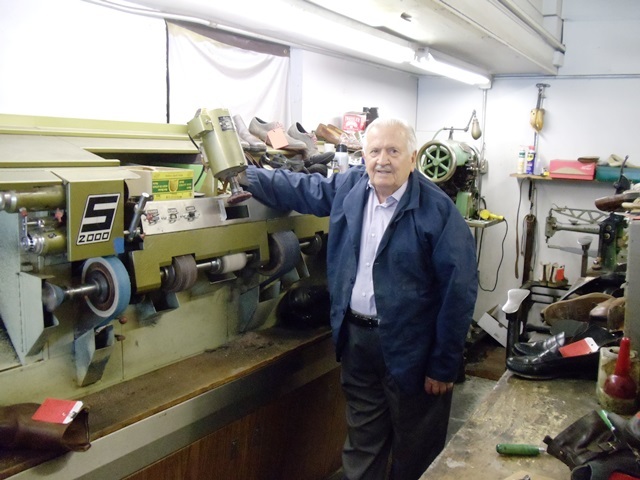 But, Mike knew that his shoe-making trade would bring him success while he learned the language at the same time but those who spoke English without a skill would face more difficulties in America. Fortunately, Mike’s Uncle Jim was able to sponsor his immigration and Mike arrived in Everett on April 24, 1967. His uncle also helped him secure a job at the Buffalo Shoe Company in Seattle, Washington, and Mike commuted between the two cities for the next 18 months. As a skilled craftsman he was able to make $2.45 per hour, much more than those without a trade. For $7.00 he was able to purchase a weekly bus pass and he remembers the German bus driver who made sure Mike was on the bus every day. 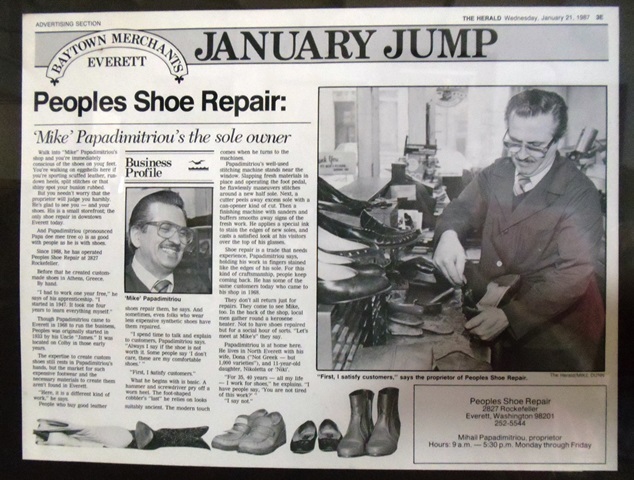 In October of 1968, when his uncle returned to Greece, Mike took over the People’s Shoe Repair business in Everett. He improved his communication skills by studying English after work at Everett Community College. It was through his own effort and the constant use of a Greek-English dictionary that he learned the language. In 1974 he once again attended Everett Community College, this time to prepare for his United States citizenship. 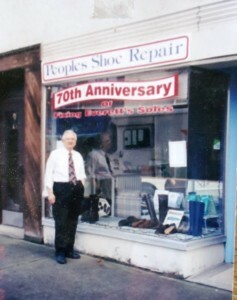 In 2004 Mike celebrated the 70th Anniversary of People’s and continues to operate the store not in an apron but wearing a cotton work jacket and appearing as the professional that he is. His rewards are more likely to come from helping a customer in need rather than from a financial gain. He believes that providing priority service for a person needing their shoes for a job interview is more important that for one who offers an extra payment for a planned vacation or social event. Mike met Dona Fries in Tacoma, Washington, where she was working at a television station. A Presbyterian from New Hampshire, she had read an article by then Greek Orthodox Archbishop Athenagoras about the increasing closeness with the Catholic Church. 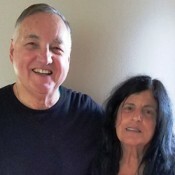 She then attended St. Nicholas Greek Orthodox Church in Tacoma and at a Greek Independence Day celebration happened to meet Mike as he was visiting friends there. They were married at St. Nicholas on October 12, 1971. 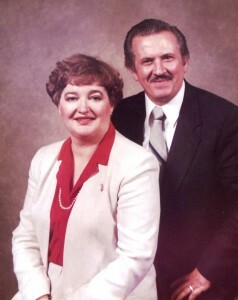 In Everett, Dona worked for the Bon Voyage Travel agency and attended travel school. She subsequently worked for AAA (Automobile Club of Washington) in Lynnwood, Seattle and Bellevue, retiring in 2000. 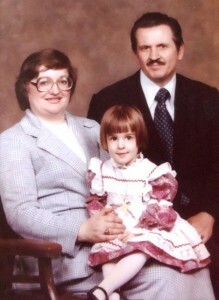 Dona quickly adopted Mike’s Greek culture, although she spoke little of the language. However, it was more her wish than Mike’s, that their daughter Nicoletta “Nikki” (born in 1975) learn Greek from her father. With Mike cooking during the week and Dona on the weekends the cuisine was an interesting mix. Nikki remembers her father referring to the smelts as “slugs” and hesitantly trying borsht and scrapple. She also remembers how her friends enjoyed listening to her and Mike speaking Greek together. Sometimes feeling stuck between two cultures and even though she could have joined the DAR (Daughters of the American Revolution) through her mother’s heritage, she has always felt closer to the Greek side of her family. Taking Greek lessons for a few years, learning to play Koultsina (a Greek card game) from older Greek women in Everett and enjoying visits by cousins from Greece all contributed to her preference. 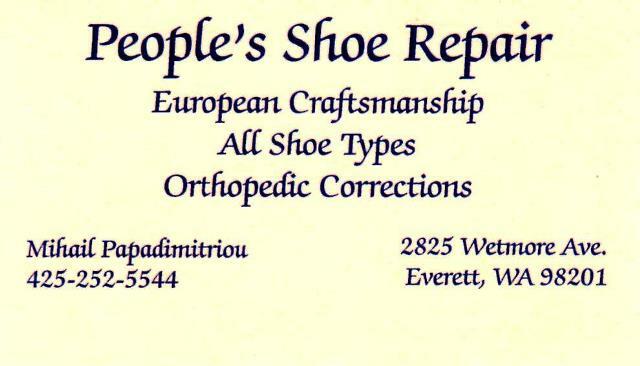 She remembers a Greek man, Vasili Papadopoulos who came from Virginia to learn the shoe business from Mike. The Papadimitriou home always had room for others at Thanksgiving or Christmas, be they Greek, American or “purple” as Mike and Dona never wanted people to be alone at those times. From his first days in Everett, Mike has kept close relationships with other Greek families: Drosos, Gikas, Koutlas, Amunsis, Raptis (see WHERE IN THE WORLD IS QUINCY?) and Baklezos. Also, Nikki has fond memories of nouna (godmother) Fotini Evans and her Greek school teacher Maria Wagner. Mike remembers the three Greek farms owned by the Pappas, Tsiknes (see THE GIVING FARMER) and Rakus families where Greeks would gather in the early days in Everett. 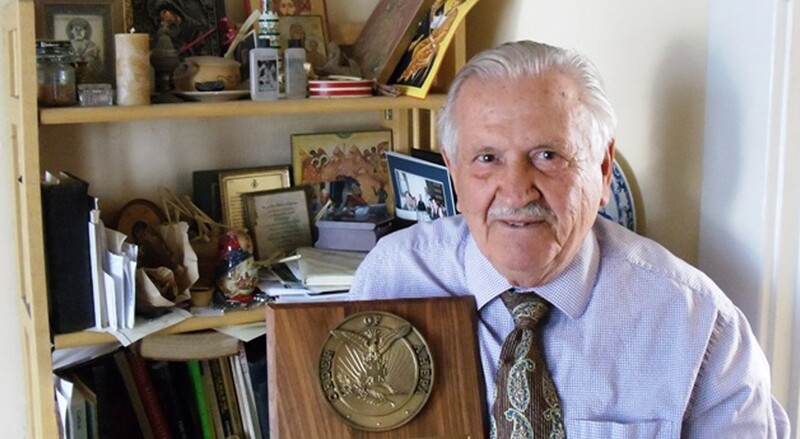 There was the American Hellenic Club which eventually associated with AHEPA (American Hellenic Educational Progressive Association) in which Mike served for over 20 years as chapter treasurer and two years as district treasurer. In the 1960s Everett Greeks met at Normana Hall with up to 45 AHEPA men and 35 women in the Daughters of Penelope, the women’s affiliate of AHEPA. In the late 1960s Greeks began hosting an “Ever on Sunday” event providing food and entertainment for the community. One year over $2000 was made on one day at this event from sale of alcohol alone and $500 was donated to Everett and Cascade High Schools respectively. When the event moved to the Everett Yacht Club, its fee requirements reduced the net profit considerably and the event was eventually discontinued. Mike and Dona especially loved New Year’s Eve when they would enjoy an evening with close Greek friends at the American Legion hall in downtown Everett. At 1:30 in the morning they would come to their home to cut the Vasilopita (St. Basil’s Bread), a Greek New Year’s tradition. Mike has always found good people to help him and has always been treated well. 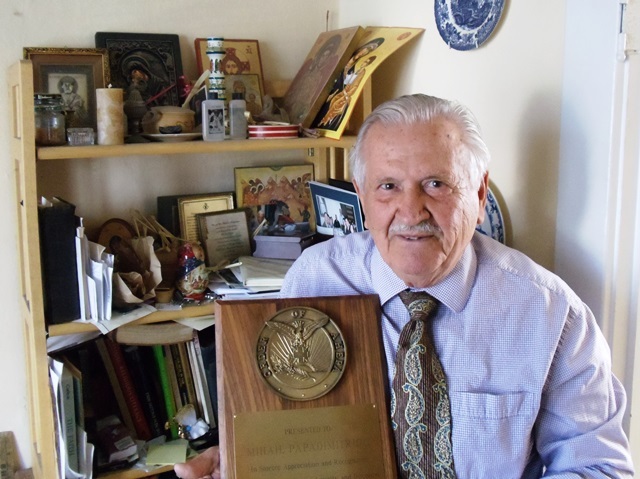 He knows that in the 1950s Greeks were treated badly in Everett, even with some Greek restaurants being damaged so that the perpetrators could ultimately buy up the businesses. However, when the Greek community organized its AHEPA chapter, the Greeks became a respected group with political strength. Mike also values the financial support AHEPA provided for Greece over the years. He knows that his life in Everett has been better than he might have experienced if he had remained in Greece. While his siblings in Greece have been fairly successful (especially his nephews), their economic situation has deteriorated considerably in recent years. Mike still lives in the 1900 vintage house which he purchased from his uncle Jim. Dona developed health problems and was cared for at home until her passing in 2013. Nikki lives nearby in south Everett with her husband Matt Tomlinson and their two children, Olivia and Mihail. Mike plans to keep People’s open indefinitely. On one occasion he almost sold People’s to an interested young man. The young man asked how long it would take to learn the business and Mike replied that he was still learning and he would only stop learning when he died. The sale did not go through.